Banksy Graffiti on the Apartheid Wall in the West Bank just outside of Bethlehem. 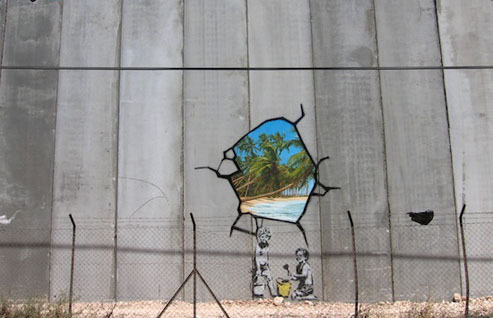 Banksy, like our bloggers, provides an alternate view of Middle East affairs. MideastPosts.com is an attempt to link the very best bloggers in the Middle East together, in a format that will do justice to the compelling copy they write. While the U.S. has the Huffington Post, the Middle East has no common platform to put the best and most influential bloggers of the region together. This is our attempt to provide that place. But why put together a site for bloggers at all? Simple, the copy they write is often far more insightful, honest, passionate and relevant than copy you will find in a newspaper. This is not simply because of the greater demands to navigate ‘the line’ of censorship in print. Yes, that’s a real issue , but as big we believe is that the majority of newspapers you will pick up today, or the news sites that you scan each morning will be filled with wire copy from AP, AFP and Reuters – stifling any uniquely Middle East voice. It’s not necessarily a newspaper’s fault – the days of having hundreds of journalist on staff have gone. Accountants rule, and editors have to fill their pages with something. Neither do these agencies do a bad job, but importantly they write for an international audience, repeat platitudes and generalizations of the region repeatedly for U.S. consumption, and certainly do not have a Middle East audience in mind. There is one other fascinating thing about bloggers. They write because they want to, not because it is their job. For journalists that means they’re dismissed as amateurs; we believe it means that when they write they do so because they truly care what they are writing about, not just because they have been told or commissioned to. James Mullan. 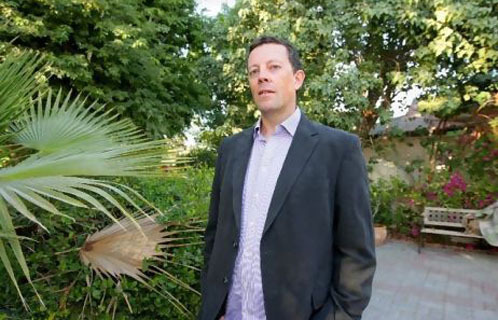 James is a former Director of a leading global public relations firm in the Middle East, and a Managing Partner of Insight, a successful media training business that works with clients at a senior level throughout the region. David Westley. David is the former Editorial Director at ITP for Digital (ArabianBusiness.com, Time Out Dubai), Head of Editorial at Yahoo!, and was Deputy Editor at Dow Jones Financial News. He is presently the MD of Turret Digital. A blogs website that bills itself as a Middle Eastern take on the US news site The Huffington Post aims to provide an alternative voice in the regional media, its founders say. MideastPosts.com, which launched in Dubai in October, comprises hundreds of posts written by dozens of local bloggers. It aims to provide a “unique” Middle Eastern take on current affairs. The Huffington Post, co-founded by the millionaire Arianna Huffington, was “the inspiration” behind MideastPosts, according to James Mullan, the site’s co-founder. “Arianna Huffington started with the same idea,” said Mr Mullan, who, along with his unnamed co-founder, is financing the site personally. “She had a lot more money than us,” he said. MideastPosts aggregates blogs published elsewhere, along with a handful of original works. Contributing bloggers are not paid for their work, but receive a link back to their own blog site. So far, about 30 bloggers from across the region have agreed for their work to be used on the site, with more being approached this year. Other writers have contacted the site individually, Mr Mullan said. Between 30 and 40 articles are uploaded each week, attracting about 1,000 visits to the site a day. Mr Mullan says that what sets the site apart is that, with a few notable exceptions such as The National, many of the region’s newspapers are dominated by syndicated “news wire” articles, which are not written with a local audience in mind. The site does not yet carry advertising, but a long-term goal is to seek revenue. “[Monetisation] doesn’t have to be advertising, it could be in terms of people wanting to support the site by making donations. It could be in any number of ways,” he said. The site is currently published only in English, but an Arabic version is planned to follow in the next few months, he said. Unlike The Huffington Post, which has a liberal slant on the news, Mr Mullan said MideastPosts had no political agenda. “[Bloggers] can be on any side of the fence, we don’t mind. As long as they are reasoned and people can follow what they are saying,” he said.